I hadn’t expected to find Wes Anderson whilst in Vienna. Beautiful coffee houses and glittering Christmas markets perhaps, but not glimpses of a man I’d spent years chasing. Since watching ‘The Royal Tenenbaums’ nearly twenty years ago, I’ve lost count of how many hours I’ve spent researching pleasingly symmetrical thermal baths. Or how many afternoons I’ve wasted browsing forums dedicated to Europe’s best kitsch-pink lidos. I often wonder how many mornings I’ve spent trying to find mustard yellow pay phones or paisley decorated train carriages. I’ve even visited an auditorium in Rotterdam simply to take photographs of its neatly aligned plastic seats; leaving before the speaker even arrived. In short, I’ve spent a lot of time trying to track down glimpses of an atypical world that fascinates me: Wes Anderson’s World. It’s not one I thought I’d find so boldly displayed in Vienna. A few weeks’ ago, we visited Austria’s handsome capital as part of the city’s brave, bold and brilliantly effective ‘Unhashtag Vienna’ campaign. Offering a complete digital detox, it was a trip free from the seductions of mobile phones and social media, allowing us to explore the city in a way that we wanted. Freed from having to find ‘Instagrammable Vienna’, I instead found myself on a wholly different path – seeking out Wes Anderson’s Vienna. It was a journey that took me to some brilliantly kitsch, dazzling and eccentric places, and one that offered a distinctly ‘Andersonian’ perspective on this European capital. Discovering Wes Anderson’s Vienna was a little like finding a world within a world, or a theme within a theme (albeit one that was ever so slightly quirkier and bolder in colour). 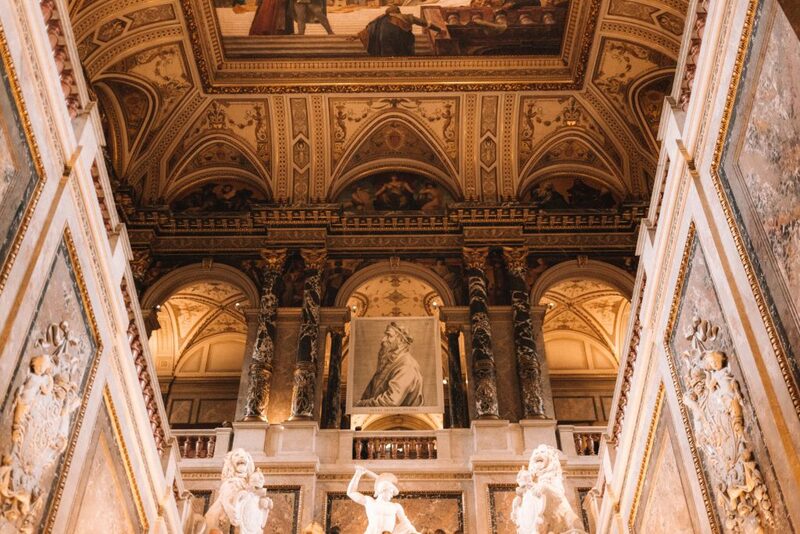 Given that Wes Anderson and his wife, Juman Malouf, have recently curated their own exhibition at the city’s grand Kunsthistorisches Museum, it therefore seemed appropriate to capture all of these beautiful spots and put them into something of an alternative guide: a guide to Wes Anderson’s Vienna. There is perhaps no better place to start a guide to Wes Anderson’s Vienna than at the city’s iconic Hotel Imperial. Having decided on the plot and narrative of perhaps his most popular film – The Grand Budapest Hotel – Anderson took off around Europe, seeking inspiration for his eventual pink palace. One of his first stops was Vienna, where he headed to the luxury Hotel Imperial, built as a palace for the Duke and Duchess of Württember in 1863. A now decadent, 5 star hotel, the Hotel Imperial remains a regal vision of silk walls, glittering antiques and towering ceilings. Dubbed ‘the grandest of grand’ hotels, it’s perhaps obvious why Anderson sought inspiration for his own mountain-top retreat here. Featuring diamond chandeliers, neo-classical balconies and smartly dressed bell boys, you might be forgiven for thinking that Hotel Imperial stars in a Wes Anderson film of its very own. A place that Brahms and Wagner used to regularly visit – and now the chosen residence for any visiting Heads of State – Hotel Imperial is a palace that drips in opulence. For those hoping to visit (but are perhaps not looking for an overnight stay), Hotel Imperial features its own, similarly extravagant Café Imperial, boasting what it claims to be the best Wiener Schnitzel in town. Visit here to soak up the opulent surroundings, and to spot features that eventually styled Anderson’s very own grand hotel. In and amongst Vienna’s grand Baroque and Gothic buildings, and nestled amongst its art-nouveau designs, lie a selection of distinctively styled buildings – each decorated a delicate apple green. Adorned with golden geometric prints – some sunflowers, other stars – each building is an example of Vienna’s famous ‘Jugendstil’ style of architecture, pioneered by the Viennese architect and urban planner, Otto Wagner. Of course, each building is not only undeniably beautiful, but possesses a neat symmetry that Wes Anderson would no doubt approve of. If any architect is to play a role in a guide to Wes Anderson’s Vienna, it’s Otto Wagner. A man that brought together the themes of industry and design, blending soft art-nouveau architecture with modern practicality, Wagner’s designs appear throughout the city like delicate calling cards: each immediately recognisable and entirely distinctive. Arriving outside of one of Wagner’s most famous pieces – Karlsplatz Stadtbahn Station– it was all too easy to imagine a Wes Anderson character waiting here. Perhaps Mr Gustav F. or M. Ivan, waiting for a train, or for the delivery of a box of hand-tied macaroons. Once one of the most modern monuments in the city, the station was one of Wagner’s proudest achievements; enabling him to not only introduce a distinct style of architecture to the city, but an entire railway network. 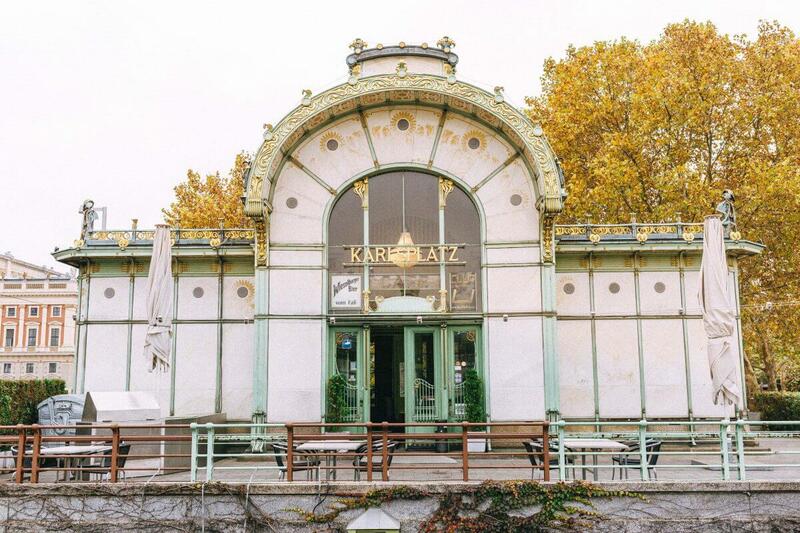 Although now abandoned (one of the station fronts is used by the Wien Museum, whilst the other is a cafe), the Karlsplatz Stadtbahn Station is well worth a visit, particularly if you’re a Wes Anderson admirer. With linear lines and a fastidious symmetry, it’s an aesthetically pleasing spot to sit and admire. Another vision of Otto Wagner’s, Vienna’s Austrian Postal Savings Bank must feature in any guide to Wes Anderson’s Vienna. Occupying an entire ‘city block’, this towering building features eight storeys and is clad in marble squares, all of which form a vaguely hypnotic pattern. Whilst the outside is no doubt impressive – inspired by Wagner’s modern take on Classicism – it’s the inside of this building that’s perhaps the most impressive: a place that is unmistakably ‘Andersonian’ in design. Inside, the building opens up into a large atrium: its glass vaulted ceiling, windows and glass floor all divided into neat, tiled squares. Over by the original Cashier’s Desks, neat gold signs are printed using matching art-nouveau typography. Even the furniture, designed by Wagner himself, is reminiscent of that found in a Wes Anderson film: neat, functional and adorned with a hint of velvet. Throughout, a strict colour scheme also applies: only interrupted by flashes of red (signifying the Director’s Office) and green (indicating the reception area). 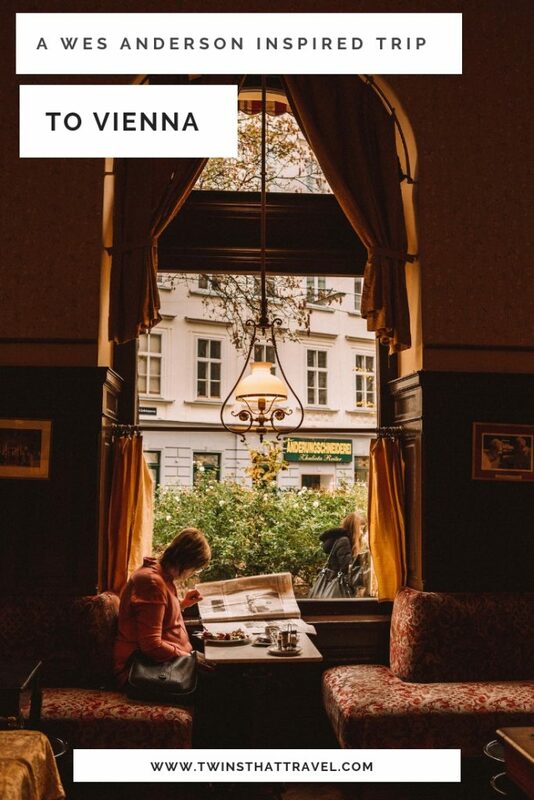 Whilst this might be a guide to Wes Anderson’s Vienna, it would be almost heretical to visit the city and not wile away the hours inside a coffee house. Thankfully, Vienna not only boasts an almost endless number of these cosy spots, but has ensured that each of these cafes possesses a distinctly kitsch, almost grandiose feel. A Wes Anderson feel. Yet another Otto Wagner design, Gerstner was opened by Anton and Barbara Gerstner in 1847, and was once the Imperial Court’s provider of all things sweet and sticky. 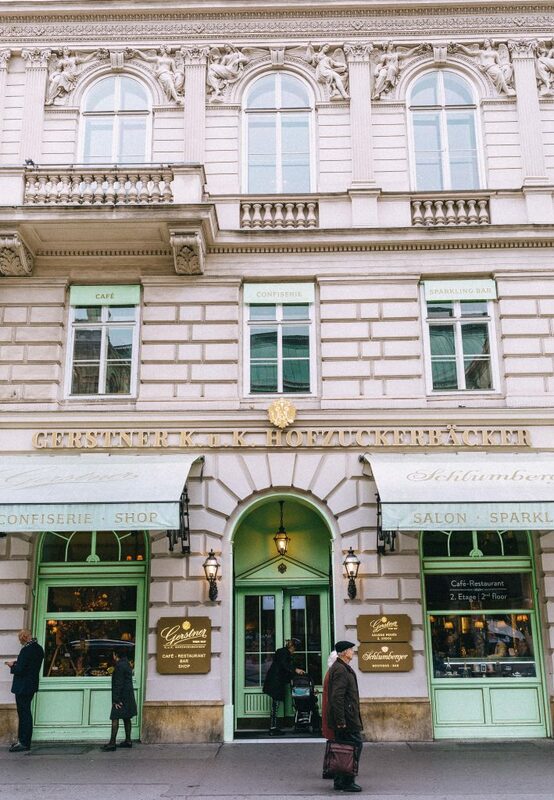 Still one of the most prestigious confectionary companies in Vienna, Gerstner is a beautiful place to order a slice of expertly crafted cake, or to indulge in a champagne-accompanied brunch with friends. Inside, the shop is filled with elegantly shaded lights, tiled floors and sweeping staircases. Outside, the store’s façade is of course an unmistakable Wagner design; featuring those delicate apple green colourways and elegantly arching windows. It’s an impossibly photogenic spot and a crucial visit for any admirers of Wes Anderson’s famed onscreen aesthetic. It is perhaps evident by now that this guide to Wes Anderson’s Vienna has one common theme: Otto Wagner. Indeed, due to Wagner’s own unapologetic love for all things symmetrical, eccentric and a little quirky, it’s not entirely difficult to imagine these buildings posing as a muse for Mr. Anderson. To complete your Wagner-like pilgrimage around Vienna, why not therefore finish your tour with a visit to the outskirts of the city (in the neighbourhood of Hütteldorf), where Wagner’s own lavish and surreally designed villa awaits. Whilst Wagner might be best known for his ‘Jugendstil’ style of architecture – a style that is sophisticated, delicate and modest – he, like all designers, had a past: a rather extravagant one. In 1888, 16 years before his later style of architecture came into vogue, Mr. Wagner designed a summer ‘palais’ that he and his family could escape to, inspired by the great Roman villas. A place filled with Tiffany glass, sweeping staircases and towering Roman-inspired columns, the villa was a place where Viennese high society would meet for glittering summer balls and parties. Later purchased by Ernst Fuchs – a celebrated Austrian artist – the Villa’s décor became even more extravagant. Filling the palace with thick vibrant tapestries, surreal artwork and glittering chandeliers, Fuchs created a surreal and sumptuous haven, hidden in the city’s 14th District. Today, the villa is a Museum – its furnishing and paintings preserved as they would have been during Fuchs’ heyday. The sort of place you might imagine Margot Tenenbaum taking a long draw from a cigarette, it’s a fantastically extravagant spot to spend an afternoon. Entrance to the Ernsts Fuchs Museum is €11 for adults, or €8 if you have a ‘Vienna Card‘. And now for the climx of this Wes Anderson inspired guide to Vienna: The Kunsthistorichsches Museum, Wien. A Museum that is no doubt worth visiting – Wes Anderson admirer or not – it was one exhibition in particular that had me marching through Vienna’s wintery streets early one Friday morning. Opened in November 2018 (and running until 28th April 2019), the Museum unveiled an exhibition curated entirely by the man himself – Wes Anderson – and his wife, Juman Malouf. An event two years in the making, the couple explored over 4 million of the Museum’s eclectic objects, deciding eventually upon (just) 423 items. 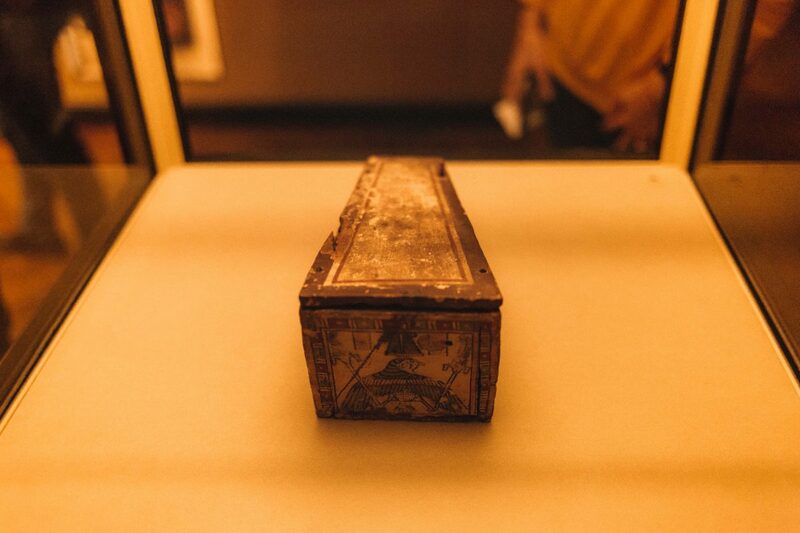 The exhibition, named ‘The Spitzmaus Mummy in a Coffin and Other Treasures’, is an ode to one of the exhibition’s smallest items on display: a tiny, decorated sarcophagus made lovingly for the corpse of a shrew. Doing away with historical provenance and chronology, the exhibition is instead based on Anderson’s unmistakable aesthetic: a mix of symmetrically lined objects (ranging from small porcelain cats to carefully balanced Emu’s eggs), items grouped together entirely due to their particular hue of emerald green, and a motley collection of vaguely sinister portraits of small children. It’s bizarre, eclectic and undeniably pleasing: an entire Museum styled by Anderson’s own cinematic tricks. Following its time in Vienna, the exhibition will move to Venice where it will be presented at the Fondazione Prada. 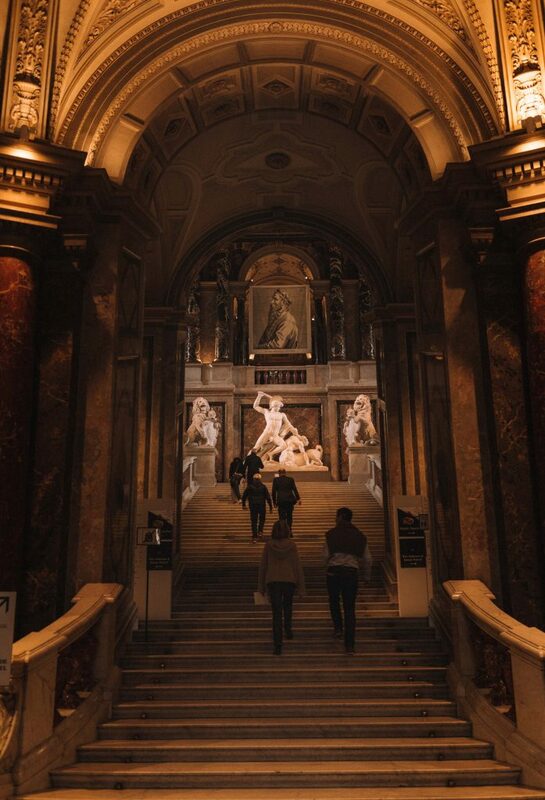 Entrance to the Kunsthistoriches Museum is €15 for adults, or € 14 if you hold a ‘Vienna Card‘. To say that Vienna is a city styled entirely by the aesthetics of one quirky, Texan filmmaker would of course be a slight leap. It would also overlook the many thousand years’ worth of architectural history that has contributed to this grand European capital. Yet, walk the city’s leafy boulevards or step inside one of its softly lit coffee houses, and it’s impossible not to feel as though you are stepping into a film set: one shot entirely in linear, boasting a neat symmetry, kitschy décor and opulent accessories. Indeed, it’s difficult not to imagine the whole of Vienna as one vast filmscape, curated by Mr. Anderson himself. For those who enjoy a hotel crowded with neatly-suited Bell Boys, or a post office filled with art-nouveau accessories, then Vienna is a city you must visit. A place every bit as beautifully scripted, curated and presented as those films I admire so much, Vienna is a capital that any Wes Anderson devotee must visit. Visiting Vienna as part of a wider European trip? Read our itinerary for Two Weeks in Europe or ideas for Alternative European City Breaks. "Putting the World into Words with Parker Pen"
"The Prettiest Spots in Vienna: A Quick Guide"